Well, let's assume it's U.S. bound, anyway. 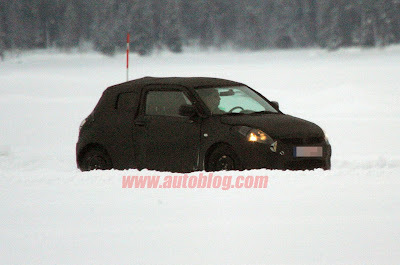 Autoblog has posted spy photos of the new sixth-generation Swift. Be sure to check out Autoblog's article for more photos. I'm big of the latest crop of Suzuki cars, and an owner of a 2009 SX4 AWD. I truly think that when (hopefully not "if") the Swift comes to the States, it will only add to the company's up-and-coming reputation. And for American Suzuki's sake, hopefully it will be a big seller. It certainly seems popular everywhere else. the Aveo RS that people may actually want. I saw the fifth-gen Swift in Germany in 2006, and I really liked it.